Announcing the “Reawakening” of a Special Group for Mothers! We found a wonderful treasure in early July! It was accidently discovered that the Confraternity of Christian Mothers was officially established here at the Church of St. John the Baptist on May 13, 1961. This wonderful group, with over two thousand Chapters worldwide, was founded to assist all Mothers as they unite their own hearts to Christ so as to help draw their families closer to the Lord. Although many years have passed since the original affiliation, our Charter remains active, and this great group for Mothers will once again become a big part of the life of our Parish, under the guidance of our Pastor, Fr. Brian Woodrow (who is now the Father Director of the St. John the Baptist Chapter). All women are welcome to attend! Please note that Benediction will follow the regularly scheduled 7:00pm Holy Mass. At present, the CCM is planning to meet on the third Monday of each month at 7:30pm. For more information, please send an email to SJBCCMothers@gmail.com. Over sixty women joined us for our first meeting, held on Sunday, September 15 ! Fr. Brian Patrick Woodrow, Father Director of our CCM Chapter, began with Benediction of the Most Blessed Sacrament in the Church of Saint John the Baptist. This was followed by a short talk which focused on the great need for Mothers in the world today. A great evening of discussion and fellowship followed. We are grateful to all those who were able to attend! The upcoming meeting schedule will be announced shortly. Tune into WFJS 1260AM/89.3FM on Wednesday, September 11, 2013 at 2:00pm! Patty Staley (host of Catholic Matters) and Dorothy Conway (Co-Host of Catholic Matters, Voices of Tradition with Fr. 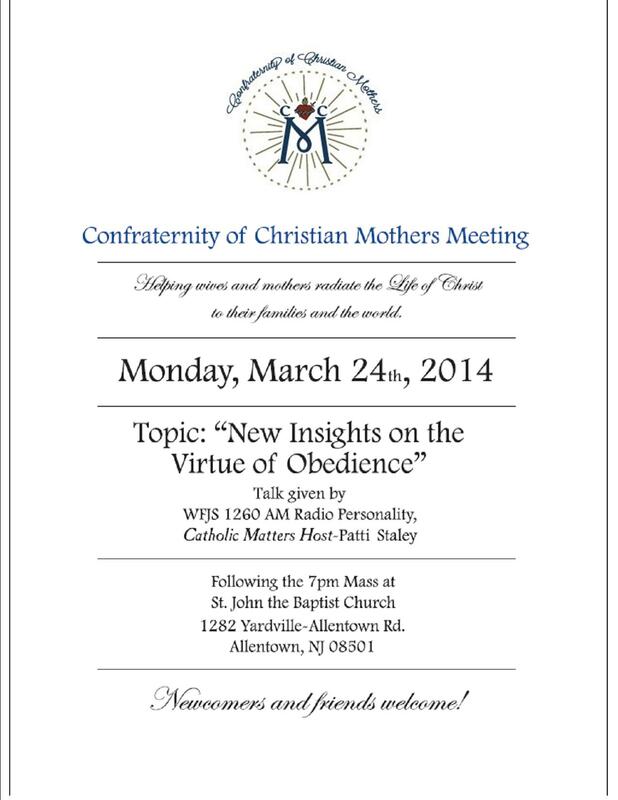 Brian Woodrow) will be discussing the Confraternity of Catholic Mothers on the Catholic Matters radio show. The show will be rebroadcast on Saturday, September 14 at 10:00am and on Tuesday, September 17 at 8:00pm. AT THE CHURCH OF SAINT JOHN THE BAPTIST! Thank you to all of the women who attended the Information Night on August 22. We have great news! Please mark your calendars for the first meeting of the “reawakened” St. John the Baptist Chapter of the Confraternity of Christian Mothers! What a Great Information Night! On Thursday night, August 22, nearly 50 women gathered to find out more about the "reawakening" of the Saint John the Baptist Charter of the Confraternity of Christian Mothers! We look forward to the upcoming launch of this wonderful group dedicated to the spiritual care and support of all Mothers. The handout from this Information meeting is available for download at the bottom of this page.